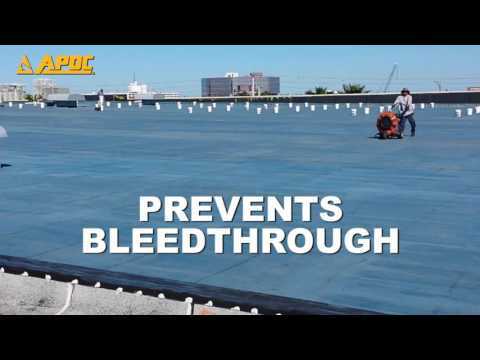 APOC® 583 Armor-Base™ is a high performance water borne epoxy formulated for use with APOC silicone coating. This product is used as a primer to create a smooth, fully adhered substrate prior to application of APOC 585 Armor Flex Silicone. Application of APOC 583 Armor-Base helps to prevent bleed through over asphalt substrates and improves long term performance and durability. Additionally, Armor Base has been designed to use with APOC Specification Grade Polyester Reinforcement. This 100% reinforced system creates a fully adhered and leak free base prior to the application of APOC 585 Armor Flex Silicone. Unlike standard silicone coatings, Armor-Base with Eterna-Dri™ Technology adds the strength and durability that truly withstands the test of time and the destructive forces of nature.